Home Tags Posts tagged with "Brother Jesse Muhammad"
No better way to spend my morning! I love speaking in schools; brings me joy every single time. Blessed to be among the guest speakers invited back to address multiple classes at Missouri City Middle School for their career day aka FIND YOUR PURPOSE DAY. Sharing with the students words from The Honorable Minister Louis Farrakhan on how they are the greatest generation we have ever produced and that each one is an answer to someone’s prayer! This has sparked some magnificent responses from them. It’s all about uplifting them, not condemning. When you’re speaking to this new generation: Be Short and Effective vs. long-drawn-out. They are sharp & will gravitate to that which feeds their nature. There is an effort to have the Honorable Minister Louis Farrakhan removed from social media. This effort will not be met without a fight! Tune into hear Brother Jesse talk about this attack and how it is being responded to in this interview with Brother Willie Muhammad on WBOK’s “Class Is In Session” show. Humility is often portrayed in this society as something weak, yet I have learned that the more humble a person is, the more powerful they can become. I wanted to share some words from the Honorable Minister Louis Farrakhan out of a study guide he produced titled “The Characteristics of Humility”. Humility is the quality or condition of being humble. One who is humble is modest, unpretentious, unassuming and submissive. The humble man does not think grand things of himself that exalt him above others. It is not a feeling that he is undeserving, but it is a quality that a leader must have to lift up the weight of the people. The power of strength is in placing it under the weight. The leader cannot pull the people from above. The leader must get under and lift them up. Watch the video of Brother Jesse’s message via Skype to the International Black Economic Forum hosted in Montreal on Nov. 19th. Thank you to Kerlande Mibel and all organizers! (Source: Hurt2HealingMag) The weekend of April 25, 2015 will live on in St. Louis, Missouriâ€™s history for a very long time. Brother Jesse Muhammad of Houston, Texas was invited by the St. Louis Farrakhan Twitter Army to bring the social media message of the Honorable Minister Louis Farrakhan to the city. Brother Jesse had already taken his message to many major cities before arriving into St. Louis and it was important to get him in the city as quickly as possible. It took just an email to get the ball rolling in the right direction. Brother Jesse told me had never been to St. Louis, but he knew lots of people from the Ferguson area from his/their online presence. He was very interested in seeing the memorial site of Mike Brown. Accompanying Brother Jesse for The Teachings Tour was Hip-Hop Artist Brother Michael 6X from Cincinnati, Ohio. They were given a grand tour of Muhammad Mosque 28 as well as the city of Ferguson by Student Minister Donald Muhammad. The program started with a dynamic performance by Brother Michael 6X, who taught the crowd the hooks to his lyrics so they could sing along in a participation style rap. The crowd was so excited to hear Brother Michael 6X perform. He gave a show stopping performance. Brother Jesse Muhammad then gave an awesome overview of how and why he started the online presence of Minister Louis Farrakhan via social media. Brother Jesse Muhammad is personally responsible for maintaining the social media accounts of the Minister Farrakhanâ€™s Twitter, Facebook and Instagram pages. Many of the people that attended the program were not aware of the importance of social media nor aware of the importance of Minister Farrakhanâ€™s presence and influence via social media. Sister Tâ€™Asia Muhammad said, â€œSt. Louis needed this, we needed Brother Jesse to come and explain WHY we need to be on social mediaâ€. She went on to further explain, â€œBro Jesse told us about a person who was looking for a mosque for 2 years, we can help get our people locally and still help The Minister nationally on social mediaâ€. The social media presence in many cities is youth based or youth led, but in St. Louis we consider our youth to go up to at least the age of 45 (laughing). So many that attended were much older than would be expected at a social media meetup. We had many older members of the mosque who wanted to know how they can get on social media to share how much they love and support the Honorable Minister Louis Farrakhan. Brother Al Lee of Muhammad Mosque 28B, East St. Louis said, â€œIâ€™m on the internet, am I there?â€ He wanted to know if he was on social media. Everyone chuckled, but he was serious in wanting to know what he needed to do to get the message of Minister Farrakhan out to his friends and family via social media. The program ended with a Q and A session, a viewing of The Time and What Must Be Done, CDâ€™s and books being purchased and autographed by Brother Jesse and Bro Michael. The night did not end before pictures were taken and a few â€œus-siesâ€. The next day Bro Jesse gave the main lecture at Muhammad Mosque 28 and it was funny, intense, spiritual, moving and overall a perfect example of why Minister Farrakhan needs witness bearers of his work and mission. Bro Jesse had the crowd on their feet throughout most of his lecture, he had so much witness bearing, and I thought we were at a Baptist Church. His words on how Minister Farrakhan loves his people so much even while he is experiencing pain and ailment, his first thought are always on the Believers. I was moved to tears hearing Bro Jesse speak of the commitment of The Minister and how he loves our people so much. Bro Jesse ended his St. Louis experience by visiting and speaking to 3 area schools. He was able to speak to the youth at Muhammad Educational Center run by Sister Kimberly Muhammad, Muhammad Islamic Academy run by Brother Ibrahim and Sister Janiece Muhammad and a local St. Louis alternative school, Innovative Concepts Academy. Missouri is known as â€œThe Show Me Stateâ€ and Brother Jesse showed us in St. Louis, how you carry yourself online, how to be an example of your word as well as how to represent self, our Nation and Minister Louis Farrakhan. Brother Jesse, you are welcome back to St. Louis anytime. Bring The Teachings Tour to YOUR City! Contact Brother Jesse Muhammad directly at: Jesse.Muhammad@gmail.com. History was made at the National Center of the Nation Of Islam in ways that could only be articulated as a modern technology in motion. 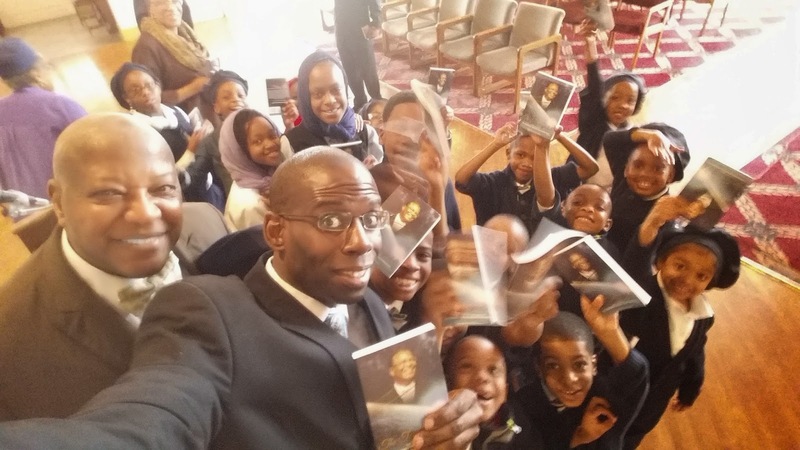 In conjunction with the Honorable Minister Louis Farrakhan speaking twice in a single day in Atlanta, Georgia, members of the mighty Farrakhan Twitter Army hostedÂ The Teachings 2.0 Book and Social Media Warfare TourÂ featuringÂ Brother Jesse MuhammadÂ of Houston, Texas. Brother Jesse currently serves as the social media strategist for theÂ Honorable Minister Louis FarrakhanÂ and is the liaison to the ever-growingÂ Farrakhan Twitter Army. 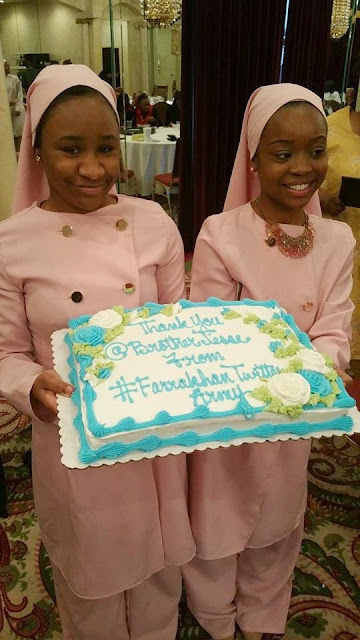 The Social Media Warfare Seminar took place on Saturday, April 11, 2015 atÂ The Salaam RestaurantÂ located at 700 W. 79th Street in the heart of South Chicago. Sister Kenya Muhammad, one of event organizers, gave a warm welcome to those in attendance and also served at the hostess introducing each speaker. Sister Halimah spoke against the morally depraved mainstream fashion trends and promoted the beauty of being a modest model for God. She elaborated on how the worldâ€™s definition of beauty has ill-effected women and young girls. She explained how it damages the self-esteem of a woman to attempt to measure up to the loose fashion trends of today. The Salaam Ballroom was packed with many young faces, families, as well as a few of the Student Officials of Mosque Maryam. The next presentation was a live performance from Cincinnati-based Hip Hop artist,Â Brother Michael 6X. He has been accompanying Brother Jesse on The Teachings Tour performing what has been affectionately called â€œThe Teachings 2.0 anthemâ€ that describes the contents of the Twitter Book and the power it contains. Brother Michael engaged the crowd with his masterful demonstration of righteous Hip Hop. Following the live performance was what everyone had been waiting for. The honored guest speaker, Brother Jesse Muhammad, and his presentation of the â€œSocial Media Warfareâ€ seminar. Brother Jesse opened up thanking the Honorable Minister Louis Farrakhan for his work, dedication and love in the Mission of resurrecting the spiritually dead. He also thanked the Student National Assistant to the Honorable Minister Louis Farrakhan, Brother Ishmael Muhammad, and his staff for the opportunity to bring The Teachings Tour to Chicago. Brother Jesse began to give the backdrop of The Teachings Tour as well as the hashtagÂ #AskFarrakhan. He delved into The Supreme Wisdom lessons as it refers to The Lion seeking a way of out of the cage using modern equipment. â€œWe think weâ€™re going to attract these young people with what we used to doâ€, Brother Jesse said. â€œMost people are more comfortable with old problems than they are with new solutionsâ€. A seasoned social media strategist, Brother JesseÂ has been on a non-stop mission to use the power of the Internet to spread awareness and positivity, while continuingÂ hands-on actions withinÂ the community. On November 18, I was guest alongside a panel of others on Just Us and You Blog Talk Radio Show hosted by Attorney Pamela Muhammad, Amatullah Muhammad and Attorney Athill Muhammad. The topic was “Ferguson under siege: A conversation on the power of Discipline Unity and Faith.” Click here to listen to the replay.